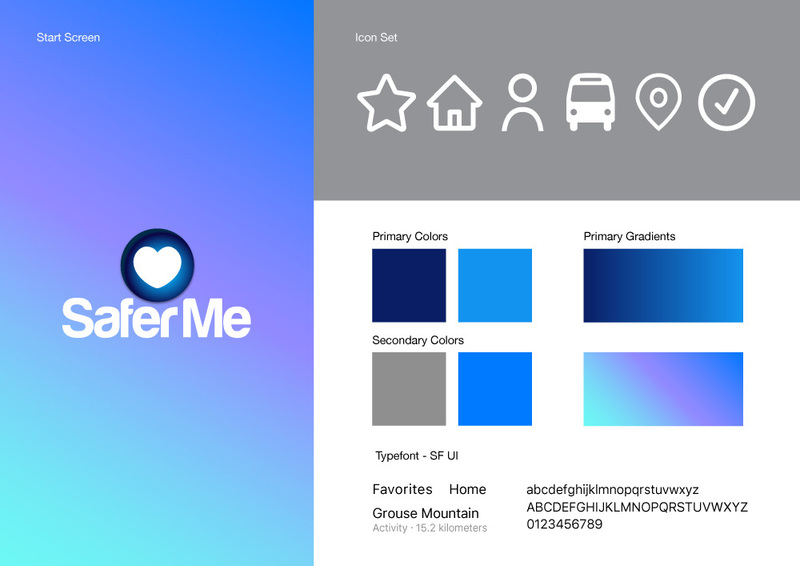 SaferMe is an App that enhances user safety in everyday situations like outdoor activities or commuting. By using localization and data sharing the users can check in during outdoor activities or plan their commutes and share those movements with someone else. The initial idea was to create a tech solution to cater the subject of safety in modern life. After having interviewed and surveyed 55 people from different backgrounds it was clear that the subject of personal safety had strong possibilities to explore. Check-in Mode – Use the localization and maps to check in places (mountain resorts, trails, parks, etc) and share all the activity data with someone so that person knows your whereabouts as it happens. Commute Mode – Use localization and maps to enable the user to plan his/her commute route and share the data with someone so that person knows your whereabouts as it happens. Crime Heat Maps – Accessing the database of crime areas from police department to know where certain types of crime happens. The first prototype was handmade and had a decisive effect on the product’s interface project allowing a better understanding of the user’s navigation. The second generation prototype started as a paper version then was digitalized in Sketch and InVision. The result was a fluid navigation after fixing the problems pointed out in the first test. This version show the need for a major addition in the app’s structure: A tab bar for user control. 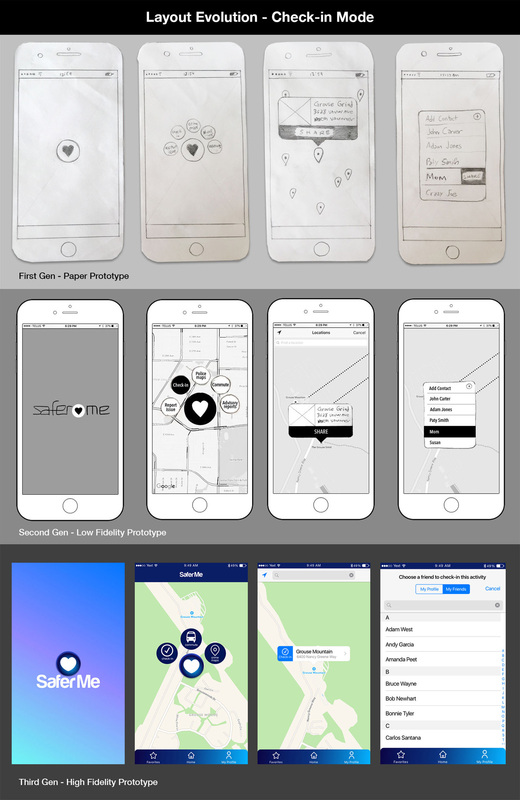 The third generation prototype was built in Sketch using the UI Kit for IOS and featured one big change from the previous version, following the main feedback from the user testing: including a Tab Bar with access to “Favourites”, “Home” and “Profile” pages. The color code was thought to have a contrast with the lower tones used by Maps so a blue hue for the base with text in white were the perfect choice to achieve the high fidelity visual. The entire project took 12 weeks from inception to the final presentation of the high fidelity functional prototype with 3 main features. The project was presented before a panel of instructors from RED Academy who were also experienced professionals in the UX industry in Vancouver. The feedback was very positive and left me wanting to continue to develop the app to incorporate the other features that didn’t make the MVP.